Samuel O. Thier's record of achievement at Brandeis included stabilizing the university's finances, developing a new undergraduate curriculum, recording record applications in graduate programs, opening the Intercultural Center and overseeing the near completion of the Volen Center and the first Shapiro Admissions Center. 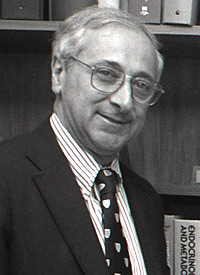 Immediately prior to assuming the Brandeis presidency in May 1991, Thier was president of the Institute of Medicine of the National Academy of Sciences for six years. Before that, he held academic positions at Yale University, Harvard Medical School, the University of Pennsylvania School of Medicine, Johns Hopkins School of Medicine and the George Washington University School of Medicine. Born in Brooklyn, N.Y., Samuel O. Thier attended Cornell University and then earned a doctor of medicine degree in 1960 from the State University of New York at Syracuse. Thier left Brandeis in 1994 to assume the presidency of Massachusetts General Hospital.